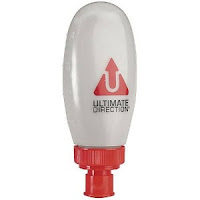 My new Ultimate Direction water bottle has arrived, and it came with a small gel flask (with a bite valve) that might fit into the pocket of the carrier. If it does, I may fill this bottle with G2 01 Prime, which would be easier to manage than a gel during the half marathon. Both bottles are in the dishwasher right now. I'll take the Fast Draw out on my next run to see how it feels in my hand. I followed yesterday's long run with an almost-four miler this morning. I tried to keep my pace easy because I was out there for recovery, but my natural competitiveness prompted me to push a little harder over the first two miles. I finally settled down and ran slower, but I'll admit that it was more due to fatigue than anything else. I was definitely wiped out by the end. Whenever I struggle on a run as short as this, I begin to question my stamina. Along the way, I realized that I was following a 12 mile workout with very little rest. It made perfect sense to feel tired. I'm officially on my taper and I hope to restore my energy level throughout the week. I'll rest on Monday, run on Tuesday, and refrain from running again until Sunday's race. I plan to do some strength training and core work between Wednesday and Saturday. One week to go. I hope I'm ready. I agree with your schedule. Being burnt out is an athletes nightmare. Sometimes we'll never know what is enough. Don't over practice. Hopefully my training hit the mark. I'll find out this weekend.